She was frightened to speak in public and couldn't eat or laugh. Her bone level was adequate for receiving conventional implants: 6 Alpha Bio implants and a 12 unit bridge. She couldn't eat or laugh. She was frightened to speak in public and shebecame very antisocial. 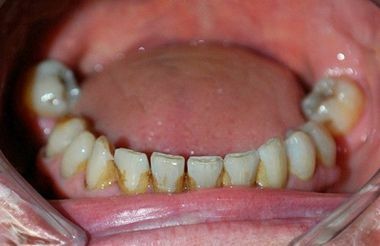 Her misfitted dentures were not good at all when she was eating, and food debris got stuck between the dentures and the jaw more and more, often causing constant pain. Her bone level was adequate for receiving conventional implants: 6 Alpha Bio implants and a 12 unit bridge. The first treatment (5 days) included the implant treatment, general check-ups and soft laser treatment to normalise cell function and promote tissue healing. 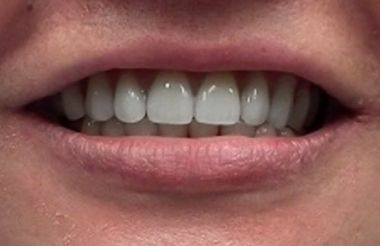 Patient received soft, temporary dentures that lay against the roof of her mouth better, making her eating more comfortable during the healing period. Four months after the first treatment, the dentist checked the implants, placed the abutments on them, took a mould and sent it to the lab. The dental technician used this impression to prepare the 12 unit bridge by the fifth day. She had also lost her lower left and right premolar tooth, which were replaced with two 3-unit bridges. It was important to prepare the bridges on the lower jaw at the same time, to set her a correct bite. Her new teeth have completely changed her eating habits: she smiles and eats with confidence and she's no longer embarrassed talking to people.